PICKPOCKETS AT WORK: Fagin, eat your heart out. 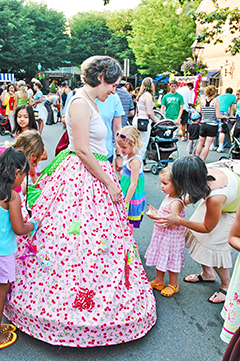 At Fridays Jazams Block Party, owner Joanne Farrugia was wearing a multi-pocketed hoop skirt that allowed little Oliver and Olivia Twists to hone their skills. Each pocket picked contained a free toy. At a special meeting last week, the Princeton Regional Schools Board of Education approved the appointment of Jason Burr as principal of John Witherspoon Middle School (JWMS). With a unanimous vote, Borough Council approved its 2010 municipal budget, which is valued at $24,716,958. Overall, $750,000 had to be cut from previous drafts of the current budget in order to meet the goals of maintaining the same spending level as last year and keeping the municipal tax rate flat. Gaining 57 and 56 votes respectively at the primary election, Roland Foster Miller and Peter Marks have obtained more than the requisite number of votes for a place on the ballot for Borough Council in November. Princeton Borough has chosen Anton Lahnston, Ryan Lilienthal, and M. Patrick Simon as citizen representatives for the Joint Municipal Consolidation and Shared Services Study Commission. Joining them are Mayor Mildred Trotman, Councilman David Goldfarb, and Borough Administrator Bob Bruschi. Attracting crowds of thousands and featuring the areas top senior players from last fall, the annual Sunshine Classic all-star football game can be a pressure-cooker for its participants. James Chuang, owner of the new Zen Modern Asian Cuisine restaurant, which opened in early June, was intent on creating a dining experience which at once offered high quality, delicious Asian food in a setting that encourages leisurely, unhurried dining, with time to appreciate and savor the dishes.